It’s the hottest club in town! Have you ever wondered if there was a place that you could take your dog to exercise, relieve stress, and have fun knowing that they would be watched over full time by trained professionals? Well, The Pet Resorts – Dunwoody is that dog daycare place! Our highly experienced staff is trained to read dog signals to prevent problem situations, not react to them after they have happened. All staff have also completed Pet First Aid Training and are educated on “bullying” behavior, dehydration and have the knowledge to recognize when a dog needs a rest period. Love this place!! My dog Harumi has such a great time and the staff is so friendly. She really looks forward to her days here. Really stellar, excellent place. I always feel very comfortable leaving my dog at The Pet Resort Dunwoody. – Lisa W.
Your dog will need to go through our Temperament Test process which goes a couple of steps further than other places. It allows your dog to adjust to a new environment first by not performing the test under forced conditions the minute you arrive. Dogs can and will act differently when you are not around, as well as when they are in a new place. This more relaxed and comfortable process allows for better results giving us a greater understanding of your dog’s personality. We then separate dogs by temperament and size which helps ensure a more pleasant experience for your pet by providing a stress free dog daycare environment. Don’t be surprised if your furry family member comes home tired and sleeps for the rest of the day! The Pet Resorts doggie daycare assists in relieving behavioral problems such as chewing, digging, and destruction of property. It also helps eliminate some of that pent up energy (especially in puppies and younger dogs) while older dogs get much needed exercise all while interacting in the play groups. 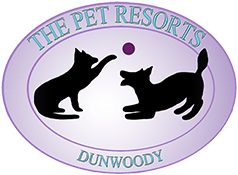 Pet Resorts of Dunwoody is the best place you can bring your dog. The staff is caring and so good with dogs. My 14 month old Golden Doodle, Daisy, walks up the front door with her leash in her mouth. She would open the front door if she could! I have used, and highly recommend, the daycare, boarding and grooming services of Pet Resorts of Dunwoody. In the past year, Daisy has been in the care of the staff many times and she gives this place two paws up!